Dynamic Picklists are multiple-choice questions that get their list of choices directly from Salesforce. Values are populated from Salesforce when the form loads, so the choices in your picklist always stay current without having to refresh the schema. Access to a Salesforce instance. Learn more about user roles and permissions. In Form Builder 5.0, set the source of your multiple-choice question to Salesforce (Step 1). In the Salesforce Prefill Connector, configure the Dynamic Picklist settings to pull the appropriate data directly from Salesforce (Steps 2-6). Begin with adding a new multiple-choice question (Drop-Down Menu, Radio Buttons, Checkboxes, or a Multi-Select List) to your form. Give the field an appropriate name and click the Choices button in the editing toolbar, which will open the Setup Choices modal. Please Note: A dynamic picklist can be created with any multiple choice question type, but once the dynamic picklist has been configured, it will always display as a dropdown box. On this modal, you will see 3 options: Manual Input, Datasets, and Salesforce. Learn more about Manually Inputting your choices. Learn more about uploading a Dataset for your choices. Clicking the Salesforce tile will set the source of that question’s choices to Salesforce and open the Edit Choices modal. Start by selecting the question you would like to update, then click the Choices button in the editing toolbar to open the Edit Choices modal. The title of the modal will be appended with the current source of choices for the question you have selected. To change the source of choices, click the dropdown button next to the current source and then select Salesforce from the dropdown menu. At that point, you will see the modal reflect information about Dynamic Picklists. Dynamic Picklist can only be configured in the Salesforce Prefill Connector. 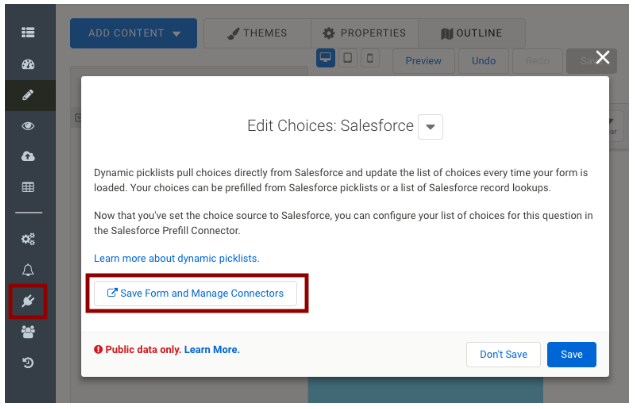 You can access your connectors by clicking the plug icon in the left side navigation directly from within the Form Builder, or the “Save Form and Manage Connector” button on the Edit Choices: Salesforce modal. Dynamic Picklists can be added to existing prefill connectors or a new one can be created. Learn more about adding and configuring a new Salesforce Prefill connector. To begin, select the type of Salesforce object that contains the information you need to retrieve. This information could be records for that object, or particular picklist included on the object. 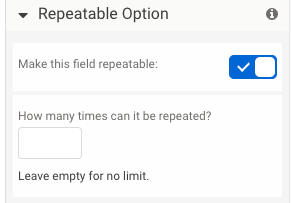 For a Dynamic Picklist to prefill choices, you must enter a valid query in the Lookup section at the start of the connector. The object lookup query is a powerful tool that can support a variety of operators and multiple conditions. To find the best query, you may need to experiment with different options. For “Salesforce object lookup results”, your query must logically include all records you would like to display. For “A Salesforce picklist field”, your query must logically include at least one result that contains your desired picklist. Account Name not equal to Formula: ""
Scroll down to the section titled Dynamic Picklists and click the Map Your First Picklist button (this section will not appear until you have selected an object for retrieval). Use the controls to set the choices that will be populated to the Dynamic Picklist field on your form. These questions: Choices include any question where the source of choices is set to Salesforce. Get their list of choices from: Choose between pulling data from a list of Salesforce records or all the options on a particular Salesforce picklist. If you assign a question to get its list of choices from “A Salesforce picklist field,” you will be prompted to specify the name of that picklist. Getting the list of choices from a Salesforce picklist requires a valid lookup query that includes at least one record containing the desired picklist. If you assign an question to get its list of choices from “Salesforce object lookup results,” you will be prompted to select the field that is displayed for each record. Getting the list of choices from object lookup results requires a valid query that includes all of the records you would like displayed as choices. Once you have set your values appropriately, click the Check button to confirm. (You will still need to Save your connector settings before any changes take effect). In the event that you need to remove or edit your Dynamic Picklist configuration, you can click the Edit button in each row. To test your Dynamic Picklists, you must view the live form. Dynamic Picklists are not currently multi-select but this option is on the roadmap. As a workaround, you can add a Dynamic Picklist and make it a repeatable so respondents can add another option. Save your form and test your form. Please Note: You will not be able to map this to a Salesforce multi-select picklist field as this is currently just a workaround at this time. You will need to map it as a repeated instance. Angela is creating a form that will link new business to existing accounts. She already uses the standard Account object to store and manage account information in Salesforce. By using a Dynamic Picklist, she can create a field on her form that will show a choice for each record in her Salesforce instance. As she adds and removes records in Salesforce, the choices on her live form will automatically update. Amit uses lots of different forms to facilitate student registration. Each of his forms needs a field for the anticipated start term, but the list of available choices changes every semester. 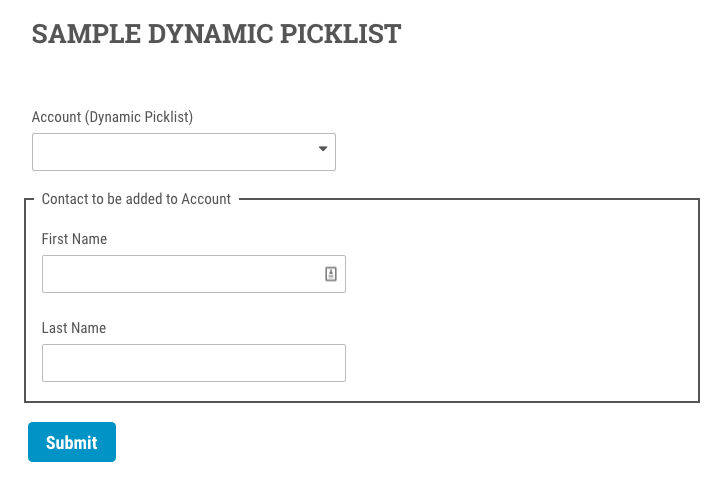 By using a dynamic picklist, Amit can populate the “Anticipated Start Term” field with a list of choices from his “Anticipated Start Term” picklist in Salesforce. When Amit updates his picklist in Salesforce, it will automatically update on every one of his forms using that dynamic picklist. Dynamic Picklists do not currently have a limit on the number of values it will pull in. NOTE: Prefilling over 250 records will potentially cause slower than normal loading times and impede form performance. We recommend adding additional criteria to narrow down prefill results or to use more than one field or fields to show your results. Please keep in mind that there is also a Salesforce API call limit that will limit your findings to 500 records per call. Dynamic Picklists now have the option of restricting values. You'll be able to toggle the switch to allow or not allow outside values from respondents. In the dropdown list on the live form, you will see the first 39 results until you define the query further by typing in a letter. Example: Your list has 200 countries. When you look at the form, it will show the first 39 of the list. If you type in a letter, say A, it will show the first 39 items that start with A. Dynamic Picklists cannot be used in conjunction with conditional questions. At times, you may want to set up an Account Name dynamic picklist but send the ID to Salesforce. In order to set this up, you'll need to lookup the Account Name. In the setup below, this will look up Account Names that were created after January 1, 2019 and list those in the picklist. In the Salesforce Submit Connector, you will create a lookup and map the Account Name to the Dynamic Picklist field.